this notion can also be traced back in the very famous ancient and historic manuscript entitled“Sangeet Ratnakar”, where it has been said: “Geetamvadayam tatha nrityam trayam sangeetam uchatay” (Brahaspati, 2002) means music is defined as the art of singing,playing an instrument and dancing. (The North Indian and the improvised version of the Indian Classical Music). schools, colleges and universities. However, history and statistics reveal that even nowthe finest artists of the Indian Classical Music are produced through the “Guru-Shishya” tradition.n India, the Gharana system has contributed to all thethree forms of music, that is vocal, instrumental and dance. strong and prominent that the audiences can immediately recognize the Gharana of the artist. Gharana, the Etawah Gharanaand the Imdadkhani Gharana hold special place (Mankaran, 2000). Likewise, the Jaipur Gharana and the Lucknow Gharana are famous for dance (Shrivastav, 1985). from him. Ustad Shahabdad Hussain also used to play sitar. The Imdadkhani Gharana is named after Ustad Imdad Khan, the son of Ustad Shahabdad Hussain. the Etawah Gharana, after a village outside Agra where Ustad Imdad Khan lived. the well-known sitarist and doyen of the Imdadkhani Gharana was also a disciple of Ustad Enayat Khan. His son and disciple, one of the greatest sitar players of all times, the world renowned sitarist, Pandit Budhaditya Mukherjee is the greatest stalwart of the Imdadkani Gharana. implications of the modulations, along with a brief comparison amongst the instrument design corresponding to the other Gharanas. This is followed by the raga repertoire in section 4. An informative and sequential study is made in this particular section. Finally, the conclusions are drawn in section 5.
transformations to both the Sitar and Surbahar & Foundation and development of the instrumental style known as the ‘gayaki ang’ are amongst the major achievements of the Imdadkhani Gharana. Tuning of an instrument depends prominently on the instrumentalist’s Gharana or style, convention and each artist’s respective inclination. The tonic in the Hindustani Classical system is insinuated as “Sadaj”. It refers to ‘sa’ or ‘kharaj’. instrument. The strings are tuned by tuning hooks. Furthermore, the key playing strings can be fine-tuned by sliding a bead threaded on each string just below the bridge and also by very small and efficient steel pegs which are nowadays gaining popularity. played. However, the Jod and the Baaj strings are tuned in the similar fashion in both the Gharanas. The Jod string is tuned to Sa and the Baaj string is tuned to Ma. gauge number 3. The Jod string was made from brass with gauge number 27. All the Tarabs and the two Chikari strings were made of steel with gauge number 0.
middle, which acted as fillers over and above the Chikari strings. These structural and tuning vicissitudes directly inculcated the Gayaki ang into the instrument. It is quite evident that the Imdadkhani Gharana has emerged as one of the most prominent and enduring pillar of the Hindustani Classical Music. The simplicity and exclusive magnificence of the Gharana has brewed it into a much coveted school of music. The “gayaki ang” is the biggest asset of this Gharana and leads to breaking of barriers between the vocal and instrumental music. Gharana. Furthermore, a brief comparative analysis is also performed between this Gharana and the other prevalent Gharanas, based basically upon the tuning systems and the structural modification details of the instrument. This style comes from of the most ancient school of music, the Gwalior gharana. It is also known as the Imdadkhani gharana after Ustad Imdad Khan, the son of Ustad Sahebdad Khan. Ustad Sahebdad Khan was trained and influenced by Ustad Haddu and Ustad Hassu Khan of the Gwalior gharana, and thus dhrupad and khayal vocal genres can be glimpsed in the playing style and in the choice of ragas. To the techniques of Been and Rebab many new techniques have been added.Ustad Imdad Khan and his sons Ustad Inayat Khan and Ustad Wahid Khan made this gharana famous. Ustad Vilayat Khan, son of Ustad Inayat Khan, furthur developed his father and uncle’s handling of midh and murki. He also modified the structure of Sitar. Instrumental in developing the unique style that characterizes the Etawah Gharana, Ustad Imdad Khan was one of the most influential instrumentalists of Indian Classical Music. He helped to establish the Etawah Gharana, which is also known as the Imdadkhani Gharana.Ustad Imdad Khan was born into a musical family. His father was Ustad Sahabdab Khan, the founder of the Etawah Gharana. Instrumental in developing the unique style that characterizes the Etawah Gharana, Ustad Imdad Khan was one of the most influential instrumentalists of Indian Classical Music. He helped to establish the Etawah Gharana, which is also known as the Imdadkhani Gharana. Ustad Imdad Khan was born into a musical family. His father was Ustad Sahabdab Khan, the founder of the Etawah Gharana. Ustad Enayet Khan was a master of Sitar and Surbahar. He developed the ‘Gayaki Ang’ in sitar, which his father had developed for the surbahar and his sons would further develop this, which would come to be known as a trademark of their gharana. He gave a new dimension to the crafting and manufacture of the sitar and his structural modifications of the instrument are still used in the instruments of today whilst his musical contributions are standardized practice for today’s musicians. The flair with which he played made him one of the greatest musicians of his generation and his legendary recordings illustrate and record the contributions he has made to music. Ustad Enayet Khan was a great ambassador for Indian classical music in India. He popularized the sitar and made it accessible for the general population. This was a time when many of the famous Indian music festivals were started. His music was the soul of India in those times of change and he had a great and unrivalled following throughout the country. This contribution to popular arts and culture can be illustrated by his friendship with Rabindranath Tagore, the legendary writer, artist and poet. Together these two giants of culture put poetry to music to bring it alive in some of the most famous Indian folk songs and anthems. Each inspired the other to take the arts of India to dizzying new heights. One of the greatest musicians in the canon of Indian Classical Music, Ustad Waheed Khan is an important figure in the Etawah gharana’s history. An acclaimed musician on both the sitar and surbahar, Waheed Khan’s life’s purpose was to be a herald for Indian Classical Music; he devoted his life to spreading his music everywhere. Living his life modestly, he made his home in different parts of India for brief periods of time, spreading the innovative style of his gharana with unwavering devotion and elegance. One such initiative included appearance in legendary filmmaker Satyajit Ray’s “Jalsaghar” (The Music Room,1958) where Ustad Waheed Khan performs on the surbahar in one of the scenes.A true emissary, he lived well into his 70s and his immense contribution to Indian Classical Music was recognized when he became the first musician to receive the illustrious “Sangeet Natak Academy Award” the highest national recognition given to performing artists in India. A select few are born with an extraordinary gift of talent yet, more often, these people end up being oblivious to their own talent, and people are left wondering what would have happened had this person lived up to his full potential. Ustad Hafeez Khan was on of them. He was the eldest son of the legendary musician Ustad Waheed Khan Saab. He not only received extensive training on the sitar and surbahar but also in vocal music. 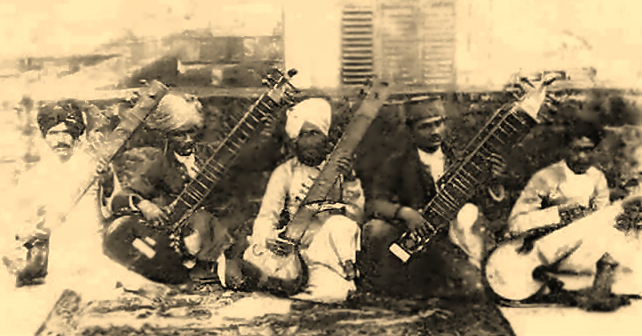 After the independence of India, the patrons of Indian Classical Music that is the Maharajas and Nawabs became commoners and classical musicians suffered as a result. Classical music, at that time, was still a form of chanber-music, and with the demise of the great Ustads like Allahdiya Khan Saab, Abdul Kareem Khan Saab, Enayat Khan Saab, Faiyyaz Khan Saab, the future of a performing classical musician was looking very bleak. It was at this time that Ustad Hafeez Khan decided to enter the Bombay Film Industry as a playback singer to earn his daily bread. He went on to become a celebrated playback singer known in the film industry as H.R Khan Mastana. Incidentally, one of the most famous playback singers of all time, Mohammed Rafi started his playback career as a chorus singer in one of his songs. He also composed music for several films. Ustad Shahid Parvez being his nephew received extensive taleem in vocal music and surbahar from Ustad Hafeez Khan Saab. Be it as a vocalist or instrumentalist Ustad Hafeez Khan could have easily gone on to become one of the foremost musicians of his generation, yet he never gave it a real try. A rare recording of Ustad Hafeez Khan, present in the family archives, reveals the virtuosity of this talented musician both as a vocalist and instrumentalist. People are left wondering what would have happened had this person perused a career as a performing Indian Classical Musician. Ustad Aziz Khan is the youngest son of sitar and surbahar maestro Ustad Waheed Khansaab. 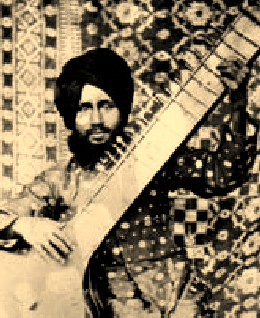 The young Gunna Bhai, as Aziz Khansaab was lovingly addressed by his family members, was introduced to music at a very young age and as years passed by he received extensive “taleem” (lessons) in the music of the gharana from his lengendary Guru and father Ustad Waheed Khansaab, in vocal music, sitar and surbahar. He also received some taleem from his equally legendary uncle Ustad Enayat Khansaab.Although his repertoire of traditional taleem was highly enviable, he did not take up sitar or surbahar as a source of lively hood. Instead, he took up music – composition as his profession. However, he never left his “sadana” that is music and performed in occasional concerts from time to time. He became a professional music composer in the Bollywood film industry composing under the pseudonym Aziz-Hindi. Even here his musical talents came to the fore. He enjoyed considerable success while composing for films like “Intezar ke bad,” “parvartan -1949,” “Putli – 1950,” “Actor 1952,” “Thoop Chaon – 1954,” “Danka -1954,” “Chalta Poorza – 1958.” Ustad Aziz Khan also composed music for several other films in partnership with another lyricist and composer, Khaiyyam. In these films, they use to call themselves “Sharma ji – Varma ji.” The very first film that they composed for was a huge hit called “Heer- Ranjha”. A few other films for which the “Sharma ji – Varma ji” duo composed music were “Parda,” “Biwi,” “Pyar ki batein,” etc, which were all musical hits. However, no matter how good he was as a composer or how famous he became as a composer, Aziz Khansaab’s taking up music as a profession did not go down well with his father. Ustad Waheed Khansaab was of the idea that a “gharanadar” and “khandani” musician, who has received so much taleem, must earn his bread through “mujlishs” (concerts) only and not through any other means. Ustad Waheed Khansaad made his displeasure known to his sons and told that he could only be pleased if and only if, he was assured that his grandchild would be trained in the music of the gharana and his grandchild would pick up sitar or surbahar as his profession, so that his grandchild could one day go on to become the torchbearer of the Etawah Gharana. In fact, after this incident, Ustad Aziz Khan’s life long quest was to train his son. He was demanding and very strict as a Guru. He would often say to his son, the young Shahid Parvez, – “I want you to play like this and I will make you play like this, no matter what it takes.” Often the Ustad’s wife would bring in food and he would forget about the food and go on teaching his son oblivious of the fact that his son would also be hungry. Ustad Aziz Khan Saab was a very hounest man. He didn’t believe in taking students for the sake of it or just to increase the numbers. However, he had quite a few students other than his foremost disciple and son Shahid Parvez Khan; and whoever was fortunate enough to receive his blessings as a student, has become established as a musician in his life. He was very strict but even more honest as a Guru. Ustad Vilayat Khan stands out as one of the greatest sitar players of all time. He was born in year 1928 in the village of Gauripur (present day Bangladesh). During his lifetime, he became one of the most influential musicians of Indian Classical Music. Several people influenced Khan sahib’s music. Ustad Enayet Khan, his father, Ustad Waheed Khan, his uncle, Ustad Zinda Hussain Khan, his maternal uncle, Ustad Faiyaz Khan and Ustad Abdul Karim Khan deserve special mention in this regard. He developed the “Gayaki Ang” which became his trademark. Khan sahib made several changes to the structure of the sitar and these include the concept of “Gol Jawari”.Ustad Vilayat Khan’s professional career was extensive. He made several international tours, he has numerous recordings, and has scored music for several films, including Satyajit Ray’s “Jalsaghar”. He was a longtime critic of the political machinations that were behind the awarding of many of India’s honours. He refused the Padmabhushan (one of India’s top civilian honours), and was a longtime critic of the manner in which All India Radio was run. The only title that he ever embraced was the title Aftab-e-Sitar (Sun of Sitar). Ustad Vilayat Khan died of lung cancer at the Jaslok Hospital in Mumbai on March 13th, 2004. He was 76 years of age. There was a Rajput in the middle of the 19th century in Gwalior. At that time there were two leaders of the Gwalior musical darbar, two brothers, Haddu and Hassu Khan. Haddu Khan was a dhrupad, and Hassu Khan was a khyal singer. They have their own unique style, and they practice only at night. Sahib Singh – who was probably a relative of Haddu Khan – was refused as a disciple, so paid for a servant to lock him in the huge bird cage of the room where the brothers practice. He had listend to them to practice every night for 7 years. Once the two brothers were roaming the streets of Gwalior where they heard their style form a house. They wanted to see which disciple of them was practicing, but they found Sahib Singh only. Haddu wanted to kill him, but Hassu made calm him down, because he realized the love for the music in the boy. Sahib Singhet was accepted as a disciple. Later he converted to Muslim so he got the new name: Sahabdad Khan. He also learned from the Senia musician Nirmal Shah, and played the surbahar, invented by himself, and jaltarang as well. He lived in Etawah (so sometimes they call the gharana: Etawah Gharana ) where he was a musician of the Naugaon darbar. He had two sons, the older was Imdad Khan and the younger was Karimdad Khan, both had been thought for twelve years by their father. Ustad Imdad Khan was born in Agra, as the second generation of what was to become the Etawah Gharana (school) or Imdadkhani , named after the village outside Agra where the family soon moved. He was taught by his father, Sahabdad Khan, a trained vocalist and self-taught sitar player, but Imdad Khan came to greatly develop and define the family style and techniques. Imdad Khan was also trined by the legendary beenkar Ustad Bande Ali Khan (disciple and son-in-law of Ustad Haddu Khan. In the 19th Century, the instrumental classical music of North India was dominated by the Senia style, passed down through the musical dynasty of Miyan Tansen’s descendants, who played in the dhrupad ang. Imdad instead evolved a style based on the newer, more popular khyal singing. It is said that in his youth at Etawah, Imdad practiced on the sitar in a state of chilla (isolation) for some twelve years. 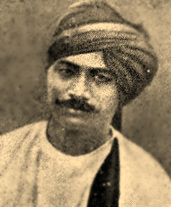 Imdad attained great fame in his lifetime: he played for Queen Victoria in Delhi; he served as a court musician in Mysore (even though he was a northerner and South India has its own classical music, different from that of the north); and he was the first sitar player ever to be recorded. Some of these recordings have been released on CD, on the Great Gharanas: Imdadkhani compilation in RPG/EMI’s Chairman’s Choice series. He taught the sitar and surbahar to his two sons, Enayat and Waheed Khan. He used to say that his two sons were his two hands, and although both of them played the sitar and the surbahar equally well, Enayat Khan’s specialization was the sitar and Waheed khan’s specialization was the surbahar. Ustad Imdad Khan actually shifted base from Etawah to Kolkata with his two sons and the house in which they lived was named “riyaz”. Enayat Khan was born in Uttar Pradesh into a family of musicians. His father was sitar great Imdad Khan, who taught him the sitar and surbahar in the family style, known as the Imdadkhani Gharana or Etawah Gharana, after a village outside Agra where Imdad once lived. He married Basiran Bibi, daughter of khyal singer Bande Hussain, and settled with his family in Calcutta, where, though he only lived to 43, he did much pioneering work on the sitar. For example, he standardised its physical dimensions and added the upper resonator gourd, which is very popular with today’s players (though his own descendants have not kept using it). In a place rapidly developing into an important North Indian centre of the arts, at a time where interest in national culture was strong fuelled by the struggle for independence, he brought sitar music out from its narrow connoisseur circles to new mass audiences. Nobel laureate Rabindranath Tagore was a musical collaborator and personal friend. Some of Enayat Khan’s recordings have been released on CD, on the Great Gharanas: Imdadkhani compilation in RPG/EMI’s Chairman’s Choice series. Enayat died young, with four children. His two sons, Vilayat and Imrat, were trained in the Imdadkhani style by other members of his extended family. Vilayat learned the sitar and Imrat the surbahar; both were to become very famous classical musicians. Vilayat Khan was born into a family of musicians tracing its pedigree generations back to the court musicians of the Mughal rulers. 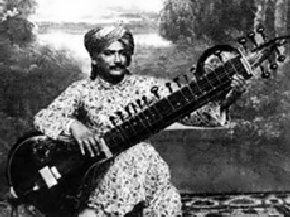 His father was Enayat Khan (1895–1938), recognised as a leading sitar and surbahar (bass sitar) player of his time, as had been the grandfather, Imdad Khan (1848–1920), before him. Vilayat was taught in the family style, known as the Imdadkhani Gharana, or Etawah Gharana, after a village outside Agra where Imdad lived. 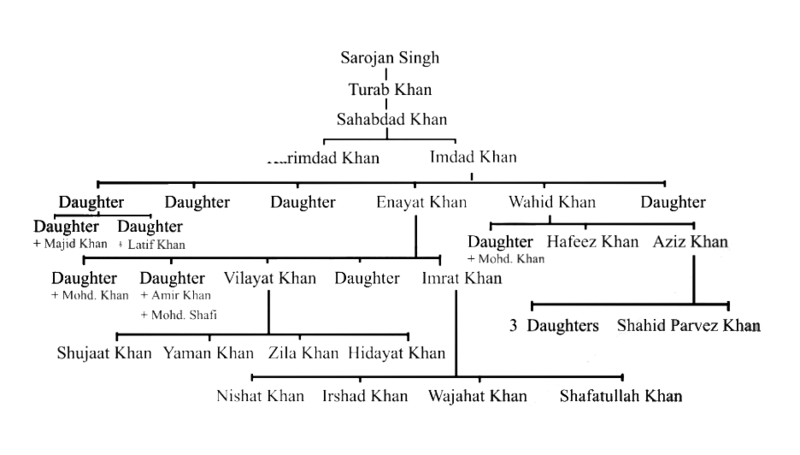 However, Enayat Khan died when Vilayat was only nine, so much of his education came from the rest of his family: his uncle, sitar and surbahar maestro Wahid Khan, his maternal grandfather, singer Bande Hassan Khan, and his mother, Bashiran Begum, who had studied the practice procedure of Imdad, Enayat and Wahid. Vilayat’s uncle Zinde Hassan looked after his riyaz (practice). As a boy, Vilayat wanted to be a singer; but his mother, herself from a family of vocalists, felt he had a strong responsibility to bear the family torch as a sitar maestro. 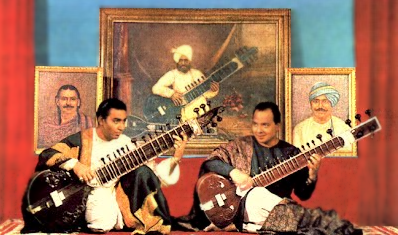 The Imdadkhani Gharana never added the bass string to their sitar, which is a smaller, lighter instrument, easier to handle, than for example Ravi Shankar’s. In the 1950s, both Vilayat and Ravi worked closely with instrument makers to further develop their respective instruments, but it was in different directions. As a result, their sounds and playing styles were also wildly different. Whereas Ravi Shankar’s sitar was large and vina-like, intended for play across multiple registers using multiple melody strings, Vilayat’s was small, with a clean and metallic sound, completely without buzz; it did not reach to the lowest register; and it perfectly facilitated his enormous playing speed. Also, Vilayat liked to perform without a tanpura drone, filling out the silence with strokes to his chikari strings. There was much more going on in his playing than the melody itself. When he died from lung cancer in 2004, Vilayat Khan had been recording for over 65 years, broadcasting on All-India Radio since almost as far back and been seen as a master (Ustad) for 60. He had been touring outside India off and on for more than 50 years, and was probably the first Indian musician to play in England after independence (1951). In the 1990s, his recording career reached a climax of sorts with a series of ambitious CDs for India Archive Music in New York, some traditional, some controversial, some eccentric. Towards the end of his life, he also performed and recorded sporadically on the surbahar. Vilayat Khan spent much of his life living in Calcutta. He was married twice, his first marriage ending in divorce; he had two daughters, Zila and Yaman (named after ragas), and two sons, Shujaat (b. 1960) and Hidayat (b. 1975), who both play the sitar. He was survived also by his younger brother, Imrat Khan, the post-war star of the surbahar field. The brothers played celebrated duets in their youth. Vilayat took few disciples other than his sons; among the best-known are Kasinath Mukherjee, Arvind Parikh and Kalyani Roy. Away from the sitar he enjoyed horse-riding, pool playing, swimming and ballroom dancing. His successes made him rich, and though he grew more pious late in life, he used to drive sports cars and dress in haute couture, and also collected such various items as firearms, smoking pipes, antique European crockery, cut glass and chandeliers. Fans and media alike liked to play up Vilayat Khan’s rivalry with and animosity towards Ravi Shankar. However, in calmer moments Vilayat would admit there was not much to it. His animosity for the politics and institutions of India’s cultural life was another matter. In 1964 and 1968, respectively, he was awarded the Padma Shri and Padma Bhushan awards – India’s fourth and third highest civilian honours for service to the nation – but refused to accept them, declaring the committee musically incompetent to judge him. In January 2000, when he was awarded the Padma Vibhushan, the second highest civilian award, he again refused, going so far as to call it “an insult”. This time, his criticism had a slightly different twist: he would not accept any award that other sitar players, his juniors and in his opinion less deserving, had been given before him. “If there is any award for sitar in India, I must get it first”, he said, adding that “there has always been a story of wrong time, wrong person and wrong award in this country”. Among other honours he turned down was the Sangeet Natak Akademi Award. For a while, he also boycotted All-India Radio. The only titles he accepted were the special decorations of “Bharat Sitar Samrat” by the Artistes Association of India and “Aftab-e-Sitar” (Sun of the Sitar) from President Fakhruddin Ali Ahmed. Acharya Bimalendu Mukherjee was born in an art-loving Bengali family at Chinsurah West Bengal, on 2nd January 1925. Bimalendu Mukherjee is a learned musician – although he was an Imdadkhani sitar student of Enayat Khan, a full list of his teachers also includes sitarist Balaram Pathak, khyal singers Badri Prasad and Jaichand Bhatt of the Patiala and Kirana Gharanas, Rampur Gharana beenkar Jotish Chandra Chowdhury, sarangi and esraj maestros Halkeram Bhat (Maihar Gharana) and Chandrikaprasad Dube (Gaya Gharana) and pakhawaj drummer Madhavrao Alkutkar. He also studied with Birendra Kishore Roy Chowdhury, the zamindar of Gouripur in present-day Bangladesh, who taught him the moribund sursringar (bass sarod). Bimalendu Mukherjee is primarily a Sitarist, though he is proficient in almost all traditional Indian instruments like Rudra-Vina, Saraswati Vina, Surbahar, Sursingar, Mandrabahar, Dilruba, Esraj, Tar Shehnai, Sarod and Pakhavaj. He is equally adept in vocal music. His contributions to the family of stringed musical instruments are the unique “Aditya Veena” – named after his son Budhaditya – and the “Bijoy Veena” – named after his grandson Bijoyaditya. He has also revived the ‘Ektantri’ single-stringed Veena – an instrument referred to by Sharangdev – and the Sur Kanan. Besides, he has experimented, modified and improved the structure and tonal quality of many stringed instruments like the Sitar , Sarod, Surbahar, Rudraveena, Esraj, Guitar, Dilruba and the Veena. Pandit Mukherjee has been constantly experimenting with the Western and Eastern philosophy of medical treatment. He has created Raga Anandamayee in That Kafi. His son has recorded the Raga in a novel way on the Sitar . This recording, released with the title “Anandamayee” (full of bliss and happiness), has been successfully experimented on patients of hypertension. Pandit Mukherjee was a member of various organizations such as The International Society of Music Education, AL-MAESTRO and Hindustani Classical Music. He was formerly Additional Director, CRMM SAIL; General Manager M and Q, Bhilai Steel Plant; Vice Chancellor, Indira Kala Sangeet Vishwavidyalaya, Khairagarh (M.P.) (1983-85 and 1988- 91). He also figures in Five Hundred Leaders Of Influence 1997 American Biographical Institute (U.S.A.); Reference Asia 5; Biography International 1991; Learned Asia 1; India Who’s Who 1993-94; International Who’s Who of Intellectuals 1997 and International Biographical Center Cambridge (U.K.) .